Silver clay or metal clay is a combination of water, binders, and small particles of either silver, gold or alloys of copper. These clays are molded by hand into a desired shape then heated in a kiln or torch to remove the binder and fuse the metal powder into a solid form. The result retains all the marks of the maker, transformed into a precious and durable object. Precious metal clay and art clay are two different brands of clay-like materials that shape easily, then amazingly fire into a pure metal object! Pmc and art clay silver can be formed and worked just as you would clay, shrinkage (8-12%). All are perfect for creating sized designs, such as rings and earrings. They fire at a low temperature in a short time! Allowing firing with a propane torch, or even on the gas stove top. Copper based clays base metal clays copper, bronze and white copper differ from precious metal clay because the metals oxidize (tarnish) in the presence of oxygen. That is what makes precious metals precious, they don't tarnish. Copper based clays need to be fired in a container of activated charcoal according to each type and brand of clay's instructions. 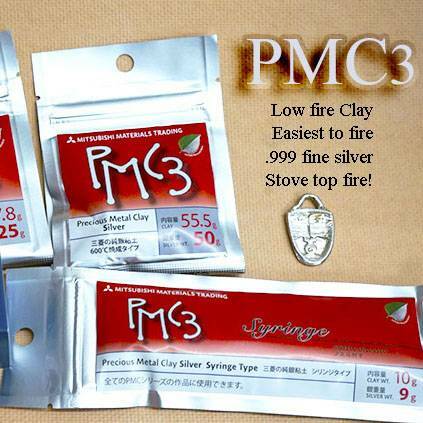 Pmc3 and art clay silver are the most popular types of silver-clay, they fires the lowest temp and are easy to work with. They are available as a slip and in a syringe. Clay type-the standard product of precious metal clay. Most of molding work is done with this type. Shape and mold the clay just as you would work with ceramic clay. Pmc3 and art clay fires harder and shrinks less than pmc+. It is a little less plastic to work with. Pmc+ shrinks 12%, fires .999 pure silver. Pmc3 (and art clay) . The primary difference is in its firing Temperature which is significantly lower than the other versions. Use the items in the kit to help you choose want you may need. PMC Silver Clay is a combination of water, binders, and small particles of either silver or gold. It is molded by hand into a desired shape then heated in a kiln or torch to remove the binder and fuse the metal powder into a solid form. The result retains all the marks of the maker, transformed into a precious and durable object. Precious Metal Clays are clay-like materials that shape easily, then amazingly fire into a pure metal object! PMC can be formed and worked just as you would clay, shrinkage (8-12%). All types are perfect for creating sized designs, such as rings and earrings. They fire at a low temperature in a short time! Allowing firing with a propane torch, or even on the gas stove top. BRONZClay and COPPRclay and NEW White copper clay can be pinched, rolled, sculptured, cut or manipulated any way you like. Then fire it and the binder burns away leaving a solid, pure bronze or copper object. Create jewelry, jewelry components, or custom-crafted specialized tools. Most copper based clays need to be fired in a sagger filled with activated charcoal in a digital kiln. Books about Silver Clays and all metal clays. Tools for the wet clay, and for finishing the dry clay. A collection of gems you can fire into the metal clay. The best way is to drill a hole the same size as the gem and push the stone into the hole, as it fires the metal clay grabs the gem stone forever. When metal clay first appeared on the scene, things were pretty simple. Then as the field progressed, there were more brands, new products, improvements and variations. Artists had choices that broadened the range of what could be done and what equipment could be used. These developments made the world of metal clay richer, more fulfilling, and, let's be honest... a little confusing. Mitsubishi Materials Trading Corporation has just announced a new product called PMC Flex.™ Two years in development, this new clay brings the longest working time of any of the current silver clays. Let's start with the specifications, then get to our reviewers' comments. What is it like: Short answer-PMC3. Same firing schedule, same density, same strength. What will it cost: As far as we know, about the same as PMC3. PMC Flex after several days of exposure to air. Like other silver clays, Flex can be fired to 1650ºF (900ºC) for maximum strength. PMC Flex,™ as the name implies, has been developed to remain flexible after the package has been opened. We all know that most metal clays have a relatively short working time. Depending on the ambient heat and humidity, clay can dry out in a matter of minutes. PMC Flex™ will remain pliable not only for hours, not only for days, but for weeks. You can roll out a long rod, set it aside for a month, then pick it up and tie it in a knot. PMC Flex™ offers two kinds of workability. Out of the package it behaves like other silver clays. It can be rolled, pressed in molds, textured and so on. Set aside, it will retain the form it is given, but that form will remain flexible. Here is an example: If I roll out a strip and give it a texture, a week later I can form that strip into a ring and seal the ends together. I can't wad the clay back into the original lump and start over completely, but PMC Flex™ can be rehydrated by reducing it to small bits and mixing with water. A spokesman for Mitsubishi says that this material will be especially beneficial to beginners and those who teach beginners, where a common problem is clay drying out before they can finish their project. It is also noted that artists can make multiple elements in advance then assemble them, including bending and twisting, weeks after the original parts were made. As you might guess, the response of reviewers was related to their level of comfort with dry clay. Some reviewers really enjoyed the longer working time of PMC Flex™ because it allowed them to modify designs days after starting a project. Those reviewers describe projects in which they want the clay to mimic ribbons, fabric, rope and other sinuous materials. GOLD CLAY FROM PMC AND ART CLAY ALSO GOLD PAINT AND FOIL. NEW 22K GOLD CLAY FROM PMC! This 22 karat material is an alloy of 91.7% gold and 8.3% silver, refined into microscopic particles that fuse at relatively low temperatures. This unique combination provides rich yellow color and unusual strength. PMC Gold can be used alone, or as a decorative element on silver items. Consider these possibilities: Co-fire silver and gold PMC side by side Layer silver and gold to make precious metal woodgrain patterns Solder or fuse PMC Gold elements to fabricated and cast items As with silver PMC, you can rehydrate with clean water, and make your own slip from sanding dust. Because Gold PMC has the working properties of PMC3, we suggest that newcomers test ideas in that material. GOLD ACCENT PAINTS - BRUSH ON GOLD DETAILS. Concept Tiny particles of pure gold (91.6%) are blended with 8.4% fine silver particles to create a precious metal with deep yellow color and the ability to fuse to silver at relatively low temperatures. The result is a layer of gold that is considerably thicker than possible with electroplating. Uses: Aura 22 is ideally suited to work with all versions of PMC and metal clay. It can also be used on wrought fine silver and, with care, on sterling that has been properly prepared (see be low). Unlike electroplating, Aura 22 requires no special equipment. Because it can be painted on, Aura 22 offers gestural responses unlike any other gold layering process. It is especially recommended for heavily textured surfaces, and for embellishing areas that would be difficult to cover with alternative techniques. Aura 22 involves almost no waste and a relatively small investment. A one gram package can usually embellish 20-30 objects.